In a surprisingly blunt speech, U.S. Treasury Secretary Timothy Geithner took China to task for maintaining what the U.S. considers a deliberately undervalued exchange rate aimed at helping China’s export industries. “When large economies with undervalued exchange rates act to keep the currency from appreciating, that encourages other countries to do the same,” said Mr. Geithner, using language that referred directly to China, in an address at the Brookings Institution, a Washington think tank. “This sets off a dangerous dynamic” as nations compete to keep their currencies undervalued. The broadsides came as leaders prepare to gather in Washington for meetings at the International Monetary Fund, followed by two sessions of the Group of 20 industrialized and developing nations. The increasingly exasperated rhetoric suggests participants are losing patience with a multilateral approach to currency issues. The fight over the value of the Chinese yuan is one of the more vexing challenges facing policy makers in the wake of the financial crisis. U.S. officials say a global “rebalancing” must take place, with countries, namely China, relying less on the U.S. to buy their goods. But efforts to pressure China to appreciate its currency and boost domestic demand have proved only marginally effective. To the U.S., China is pursuing a mercantilist strategy that favors its industries at the expense of competitors in the U.S., Europe and Asia. China sees itself as pursuing its national interest and a strategy that has turned the country from an impoverished also-ran into a powerhouse. Mr. Geithner hasn’t named a target for Chinese currency appreciation that the U.S. would find satisfactory. But he has often spoken favorably of the 20% rise in the yuan from 2006 to 2008. Since 2008, the Bush and Obama administrations have pressed Beijing unilaterally and in a variety of multilateral forums to let the yuan appreciate. Beijing relented in June 2010, shortly before a G-20 leaders’ summit, and said it would allow a more “flexible” exchange rate. Since then, the yuan has appreciated by only 2%, infuriating members of the U.S. House, who passed legislation last month to penalize China over its currency practices. In September, President Barack Obama made a direct pitch at the United Nations to Mr. Wen on the currency issue. The U.S. blames China’s undervalued currency for prompting other countries to try to drive down the value of their currencies to compete with China. Recently, Brazil, Japan and South Korea have intervened in currency markets. The G-20 last year crafted a process designed, among other things, to encourage changes in Chinese policy. Under the so-called framework pact, countries with large trade surpluses, namely China, agreed to reduce their reliance on exports. Countries with large trade deficits, namely the U.S., agreed to increase savings and rely less on imports. The overarching goal is to spur globalglobal growth. But the framework has no enforcement mechanism and U.S. officials fear that countries are making pledges but not following through with no fear of repercussions from the IMF. Mr. Geithner suggested the IMF could play a larger role. In his speech, Mr. Geithner suggested countries with undervalued currencies could cooperate on kind of joint currency appreciation. In that way, China need not worry that Asian competitors such as Malaysia and Vietnam will gain an edge if the yuan rises in value. Mr. Bergsten, the Peterson Institute director, said China might be willing to work with other Asian countries in the same way U.S., Europe and Japan over the years agreed to boost or reduce the value of the dollar. 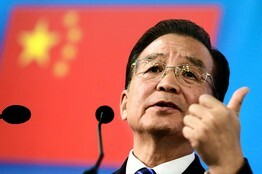 If Asian countries “could get together and work out how much they should move, that would do it,” he said. Still, U.S. politicians have blasted China on the campaign trail, with Democrats accusing Republicans of sending jobs to China and Republicans accusing Democrats of supporting policies that allow China to load up on U.S. debt.